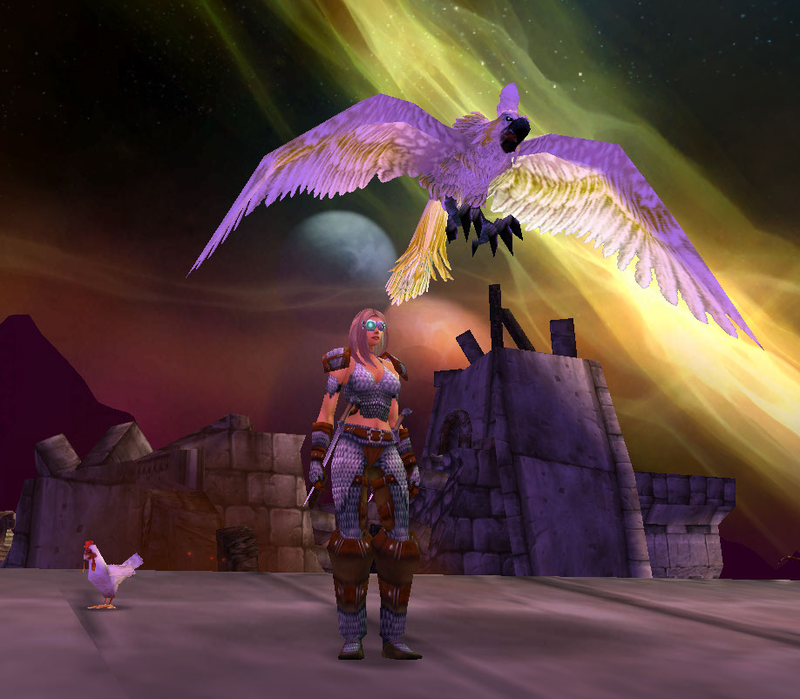 Prepping For Transmogrification: Alliance Edition « It's For My RP Spec! 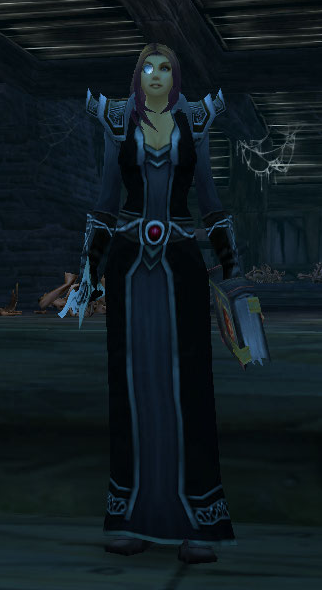 Velanthria Wylde (formerly Lady Allandrya Hildebrand Courcel) embodies all that is wrong with Azeroth: a self-serving and manipulative noble with an entitlement complex, Velanthria brings to mind dark grey and black, with jeweled accents and of course a monocle. Mogging for Abs is going to be very difficult. As you may remember from the post about her, she mostly wears leather in character. 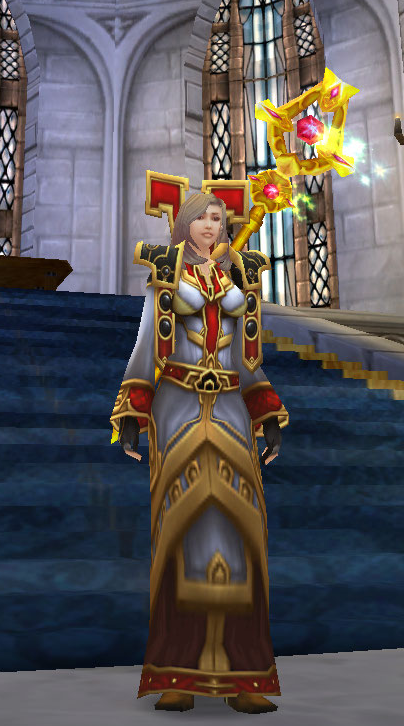 Since we won’t be able to transmog across armor classes, this made deciding on an outfit extremely difficult. Couple that with the fact that she almost never wears gloves (only bracers, to double as an arrow guard) and it was an exercise in frustration. 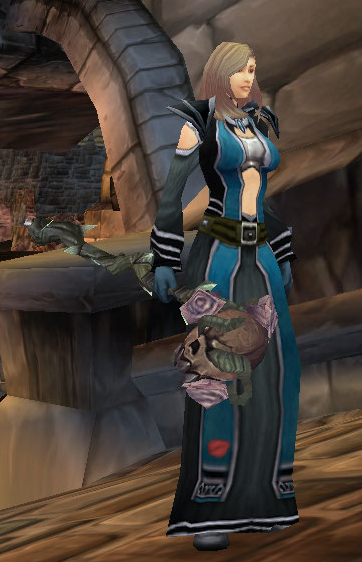 I browsed her bank, which includes some S1 Arena gear and hunter Tier 4, and decided to go a with a mix-n-match mail set that (hopefully) conveys her personality. 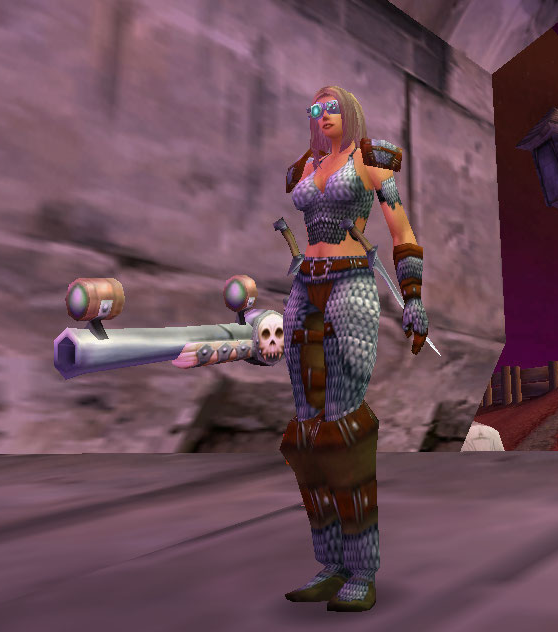 Assuming that the “no melee weapons for hunters” change goes through in MoP, I’m not including her melee weapons, though I would probably have a Nexus-Claw and Void Talon on her, since the Right-Handed Claw and Left-Handed Claw are white-quality and therefore could not be mogged. Abriella is pictured with Sileny. 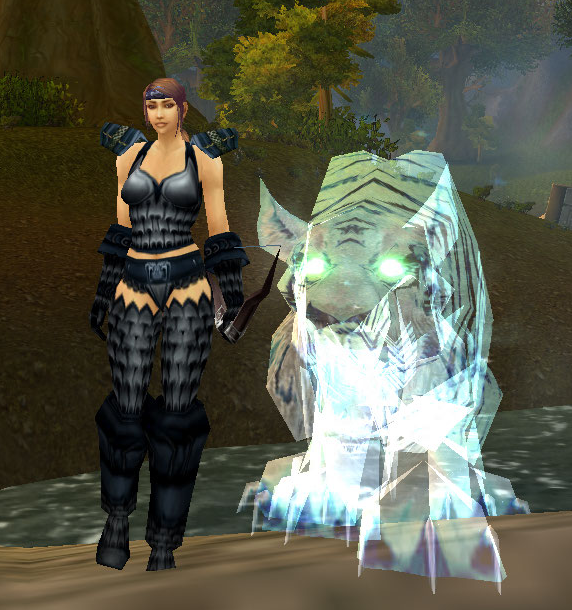 My newest hunter, the widow Salyra is indeed Abriella’s old sister. 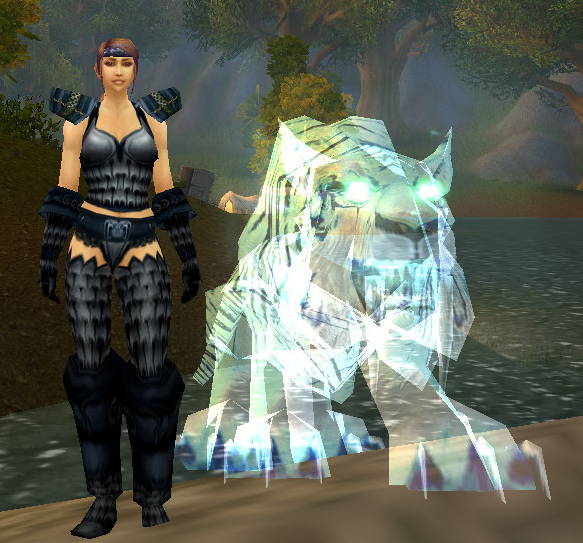 She is very militaristic and served in both the Outland and Northrend campaigns. She returns to Honor Hold regularly to offer aid where she can. She is pictured with Halcyon. Oh, Tanwen. What is there to say about Tanwen? She is still the same crazy priestess she’s always been, torn between the Light and the Shadow. 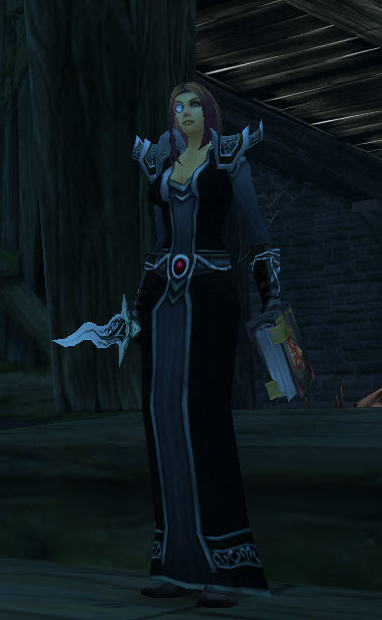 Her Discipline transmog is a little generic, I admit, but I have some more ideas cooking. I didn’t want her Shadow ‘mog to be too dark and evil (although I guess I could have done full Dreadmist, ha!) but maybe a little… cult-y? Yes. A little cult-y. So there are the Alliance ladies. Stay tuned for my Horde sets as well, including my pesky goblin. Or maybe a Brown Linen Shirt or Rustic Workman’s Shirt — those would work nicely, too, I think, because of the brown trim/leather strapping on the rest of the items.